The stunning Caribbean beaches are fairly easy to get to for us Midwesterners and East Coasters. With white sand, turquoise water, and magnificent views, what more could you ask for? We’ve rounded up our favorite beaches in the Caribbean, below, plus where to stay to take advantage of each. Turks and Caicos is easily one of the most beautiful groups of Caribbean islands you’ll find, with a number of stunning beaches. The beach at Grace Bay, however, is on a whole different level! The snorkeling and scuba diving is unbeatable here, and if you’re not really a water person you can still get your underwater fix at the Coral Gardens snorkeling park. 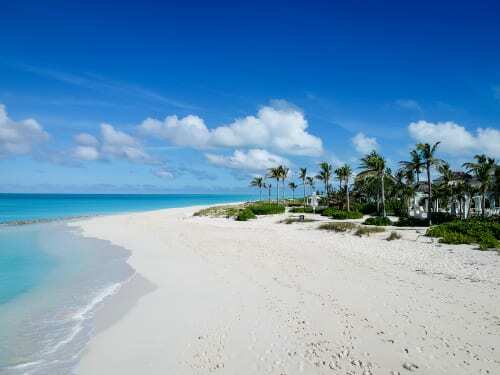 Where to Stay: We recommend staying at the 4.5-Star Seven Stars Resort in Turks & Caicos. This resort does not offer an all-inclusive option, but you can opt for the European Plan for 2 adults for 3 nights starting at $1,493. 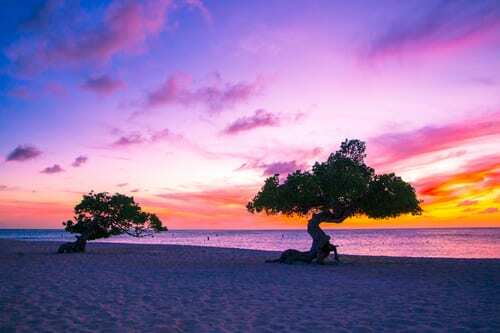 Aruba is different from a lot of the Caribbean islands because it’s turquoise water and white sands sit in direct contracts to the desert hills in the background. Eagle Beach is the perfect place to enjoy these unique views. Also unique to this beach are the famous bending fofoti trees, pictured above. Where to Stay: One of our favorite resorts in Aruba that is also within walking distance of Eagle Beach, is the 4-Star, All-Inclusive Hotel Riu Palace Aruba. 2 adults can stay here for 3 nights starting at $1,763. The Dominican Republic has become a hotspot for tourists in the Caribbean. In order to take advantage of the best beaches in the DR, you must venture a bit farther north. Many of the best beaches are located in the former fishing village of Las Terrenas. “El Coson”, as it is referred to by the locals, is the most isolated and stunning of all Las Terrenas’ beaches. 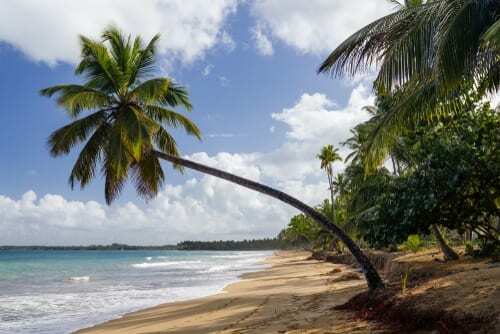 Where to Stay: Stay in the Samana area of the Dominican Republic for easy access to Playa Coson. We suggest staying at the 5-Star Luxury Bhia Principe Cayo Levantado Don Pablo Collection All-Inclusive resort. This resort is nestled on it’s very own private island. 2 people can stay here for 3 nights starting at $1,007. Seven Mile Beach is one of the more well-known Caribbean beaches on this list, but no less stunning. 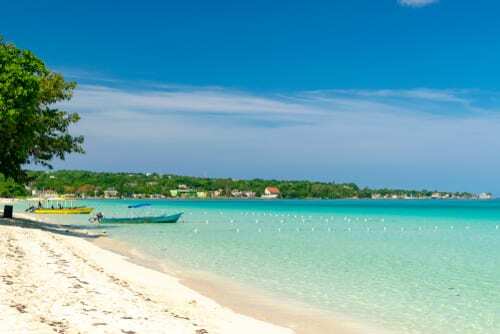 Go to Negril in order to see this long stretch of white sand, and stay for the laid-back, hippie-esque vibe you’ll find on this friendly island. Plus, this beach is home to the famous Negril Cliffs, where adrenaline-seekers can climb 30 feet to the top and dive directly into the Caribbean Sea. Where to Stay: We suggest you stay at the 5-Star, All-Inclusive Royalton Negril Resort & Spa. This resort is family-friendly, but they also have an adults-only section called The Hideaway. 2 people can stay here for 3 nights starting at $1,256. Saint Croix itself is fairly secluded, but Buck Island is even more so. It is located 30 minutes by boat from mainland Saint Croix, and the island is a national preserve. It is one of the top snorkeling spots in the world, with crystal clear waters and incredible coral reefs. 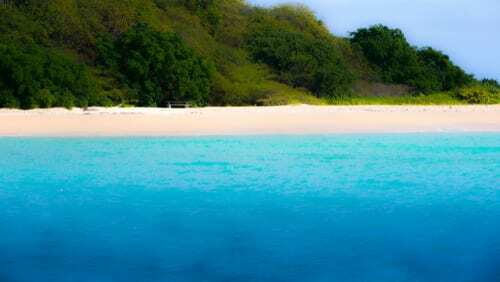 Where to Stay: Again, Saint Croix is rather private, and we would actually suggest staying on St. Thomas or St. John for more options in accommodations and more things to do. Then you can take a ferry directly to Buck Island or get there by stopping on Saint Croix first. In St. Thomas, we suggest staying at the 4-Star, All-Inclusive Bolongo Bay. 2 people can stay here for 3 nights starting at $1,419. Book your next getaway with Enchanted Travel! Call us today at 402-281-3022.